I haven't shared my favorite wines in quite some time, so I figured that summer is the perfect time to do so! I'm a big fan of a cold glass of rose on the deck in the summertime, but my love for wine does not end there. A crisp white or even a bold red are also more than acceptable wines at this time of year-- as long as they're paired with the right food, of course! Here's a roundup of a few of the wines I have been enjoying this summer-- and the recipes that you should enjoy with them too. Hogwash Rose - This is officially my favorite rose. That's sort of like picking a favorite child (in a kind of alcoholic way), but after sampling many this is the one that I love best. I discovered it a few years ago at a tiny (now closed) beer & wine shop in my neighborhood. The guys there recommended that I bring it along to a summer party I was headed to and they were right-- it was a hit! Fast forward to this spring when my picked up a bottle that we enjoyed by the beach in St. Simons Island, GA and I was reminded of how much I loved it so I found it at my local Whole Foods and have been enjoying it all summer long. It's a medium-bodied rose with fruity aromas and the perfect companion for barbecued food! Frescobaldi Pomino Bianco DOC - The first thing that I noticed about this wine was how gorgeous the bottle and label were... I'm a sucker for good packaging and would say that if you believe that you "eat with your eyes first," then the same might be true for drinking as well. Beyond that though, this is a great summer white wine. Grown in Tuscany, it's a blend of Chardonnay and Pinot Bianco so it's dry, but not as harsh as some Chardonnays can be with some great fruity notes. 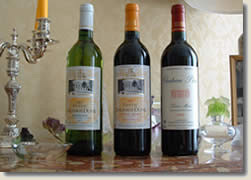 Château Saransot-Dupré Cru Bourgeois - I know embarrassingly little about French wine. I'm a big fan of Italian wines, love a good wine or sparkler from the Pacific Northwest... but French, I'm clueless! I may not know much about it, but what I can tell you about this Cru Bourgeois is that I like it... a lot! It's a gorgeous deep dark red blend including Merlot, Cabernet Franc, Petit Verdot, and Cabernet Sauvignon. It's a full-bodied wine with notes of balsamic and espresso that feels decadent to drink in the summertime, but because of that it is a great one to sip and savor on a summer night. Frescobaldi Nipozzano Riserva - This Chianti Rufina Riserva is a good one! After spending several months living in the Tuscany region and being a lifelong lover of Italian food, Chianti is definitely one of my standby reds. That said, sometimes the same old ones can get boring. This Tuscan Nipozzano Riserva is a little different: A nicely balanced red with big fruity notes (they cite cherry, plum, raspberry) with hints of spice like nutmeg and pepper. Anne Aimee Cuvee A Midnight Saignee Rose Pinot Noir - You have my mom to thank for this rose too! After sampling it at a favorite wine shop she gifted me a bottle as an early birthday gift knowing how much I love rose-- and because I share a name with the vineyard! This rose is nice and dry with fruity notes like strawberry and cherry and spicy ones like chai spice and white pepper. If you like a dry rose, this is a great find! Editor's Note: Complimentary samples of Frescobaldi and Château Saransot-Dupré were provided in order to facilitate this post. As always, all opinions are my own. I should try out the cold hogwash rose during this holiday, this is best for relaxed moments as i look forward to my sabbatical. If you can't stand crowd then for sure get here early to start off your night. Our group did this just a few days ago and quaffed down some tasty beers and ciders before making our escape to further home studios NYC in the city. Do not miss the chance to get Best natural hangover remedy from Detoxicated’s website. They can ship right to your door and help you enjoy a night of drinking with friends without having to worry about a pesky next day hangover. I've tried Detoxicated before and it actually works. Just a bunch of vitamins and anti-oxidants that protect your liver and break down alcohol so you aren't left with a hangover- its great! إغلاق الأبواب والنوافذ في المنزل، وعدم تركها مفتوحة، بالإضافة إلى التخلص من تجمعات النمل المحيطة بالمنزل من خلال استخدام مواد كيميائية خاصة، ومبيدات الحشرات.